My friend Connie gave me this Caesar Salad recipe and when I made it, found that the Worcestershire has enough anchovy flavor for my taste so I didn't need to add any. Tom absolutely loves anchovy so he gets his own side dish to add a few anchovy filets to his salad. Many of us avoid the raw egg for safety reasons so this recipe uses mayonnaise. If you prefer to use egg, it can be raw or coddled egg yolk, just omit the mayonnaise. And of course the best croutons are home made, which are very easy to make. I like to use a nice french bread. They disappear fast so make enough so you have some for the salad. Press garlic and blend with oil and let sit for at least 30 minutes to infuse the garlic into the oil. Using a fine mesh strainer, strain garlic from oil and set aside. Heat 10 inch skillet on medium heat. Put bread in bowl and drizzle 1 Tbl oil evenly over bread, pinch of salt and toss. Repeat until oil and salt are used up. Put bread in skillet, turning cubes and shaking pan until crisp and golden brown. Return cubes to bowl and set aside to cool. Prepare the dressing: whisk lemon juice, Worcestershire sauce, mayonnaise, garlic, salt and pepper in a small bowl. Slowly blend in oil. In a large wood salad bowl, press garlic to sides and coat the bowl. 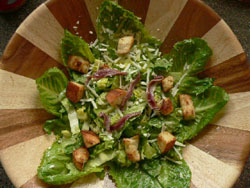 Add Romaine and toss with dressing. Add cheese and croutons toss again. Taste and adjust seasoning as needed and serve. Have additional cheese available for individual likes. And don't forget the side of anchovy. Add grilled chicken or cooked shrimp to make a dinner size salad for a meal.